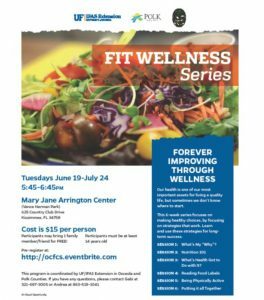 FIT – Fo rever Improving Through – Wellness Series is a 6-week series that combines education, hands-on activities, and practical application to your personal health. Since its inception in 2015, participants have seen great results, including a 6-10 pound weight loss, lower blood pressure and A1c, and more energy and confidence. Several months after finishing the series, some have continued to apply the lessons learned in their daily lives. So what is it exactly that we do in the series? The program starts with a discussion of your “Why?” for making healthy changes in your life. Is it for your family? For your children? Because you want to live as long as possible? Because you want to look good for summer? Every reason is important because it’s YOUR reason for continuing when things get tough. In addition, participants set at least one goal that they work on during those six weeks, and monitor their progress with weekly weigh-ins. Participants can also track other items that are linked to their goal. Each week focuses on a new health-related topic. The order of topics is relatively the same for all series, but may change depending on the needs of the class. Participants will learn how to read a food label, how to plan a healthy meal, determine portion sizes, exercises for all abilities, and chronic disease prevention and management. We also have discussions that are specific to each group depending on their interests – for example, talking about exercises for arthritis, night eating syndrome, healthy eating after gall bladder surgery, and more. In this series, we will be introducing a food prep component so participants can learn how to make simple, healthy snacks at home. Our next series runs Tuesdays, June 19-July 24 in Poinciana at the Mary Jane Arrington Center in Vance Harman Park. The address is 50 Country Club Drive in Kissimmee. The cost of the series is $15 and you can bring someone with you for free! Your guest must be at least 14 years of age. The cost includes materials, snacks, and goodies. Pre-registration is required on our Eventbrite page. This series is done in collaboration with UF/IFAS Extension in Osceola County and Polk County. If you have any questions about the series, you can contact Gabi in Osceola County at 321-697-3005 or Andrea in Polk County at 863-519-1041.